The Screen saver add-on makes it possible to push your content to screen savers. This function can make dormant screens throughout an entire office scene convey the same tailored message. The Web Player is a quick and smart way to send digital information as a simple URL. Gather your information, create the link and send it as email, SMS or even as a QR-code printed in a brochure. Even after link creation, content can be altered and updated, so that your URL will remain the same but the information it points to can be fresh and adequate. The Web Player is a marvel when wanting to quickly push information to smartphones and tablets. For instance in a trade show setting where your target recipients are mobile. Make easy super easy! Smartsign Sync allows you to make changes and updates to your content on your own computer or on a remote server. Synchronize any folder on your computer or server and everything in the folder is automatically published on your screens. No need to log into the Smartsign Display Manager software. The new Smartsign Mobile Play is the perfect delivery system for making information available to individuals on the go and a perfect solution for quick and flexible internal communication. 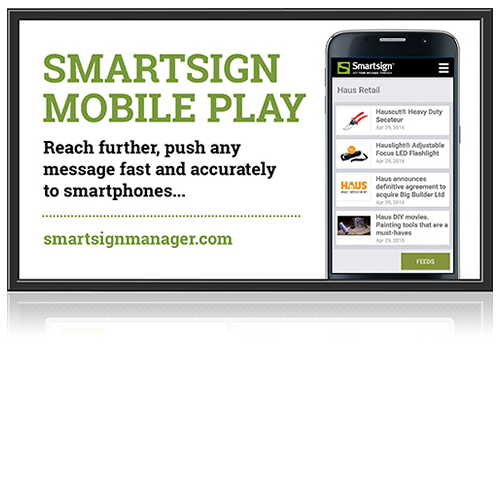 It lets you push any message (text, images, audio, video or documents) to any smartphone through the Smartsign Mobile Play app. Consider it the ultimate marriage of text messaging and email as this setup lets you push the perfect information mix to any smartphone, delivered in seconds. The Smartsign meeting room manager is an add-on that’s equally suitable serving a conference facility, hotel setting or an office environment with a vast number of meeting/conference rooms. The meeting room solution guides staff and guests to the right meeting rooms and can also manage facility bookings by connecting to your existing system. Smartsign Manager is a completely packaged digital signage product that lets you create, publish, deliver, schedule and display content on any platform and any device. It has applications across a host of vertical markets from corporate business to hotels, restaurants, transport, retail, healthcare and education. Scalable, future-proof, easy to use and completely web based, it provides an open platform that can support all major hardware. It’s time to control your messages and advertising packages, change content efficiently and control information centrally or locally. With Smartsign Manager, digital signage is easy.